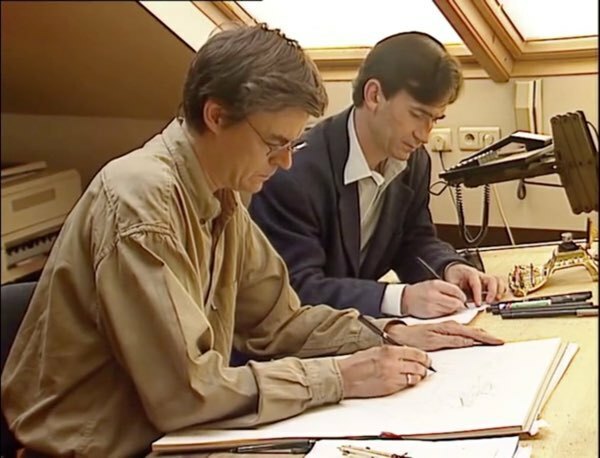 This is a 12 minute video of a younger Francois Schuiten working alongside his writing collaborator, Benoit Peeters, on a page. It’s all in French, so it’s mostly lost on me (except when Schuiten grumbles that his page is “terrible”, which is universal), but getting to watch Schuiten do quick “doodles” with a brush pen is awe inspiring. It’s the exact opposite kind of work from what you just watched on Friday, but it’s also impressive. 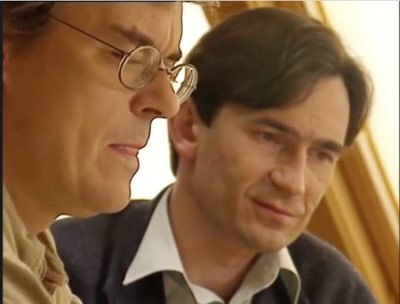 In the second half of the video, we’re back to Schuiten doing the painstaking work with the colors and inks. I try to picture a writer and artist in American comics working this way together and my mind explodes. Disclaimer: this video comes from the late 1990s. DVDs were around but the world wasn’t shooting everything in high definition yet, and people were still resisting 16:9 tv screen formatting. Thank goodness we won that war. 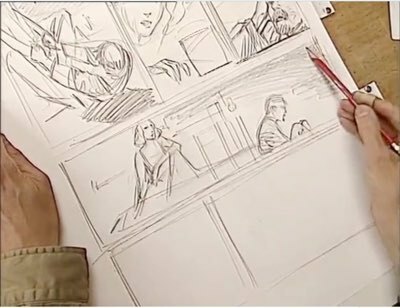 0:19 – Peeters sits shoulder to shoulder with Schuiten to work on a page. 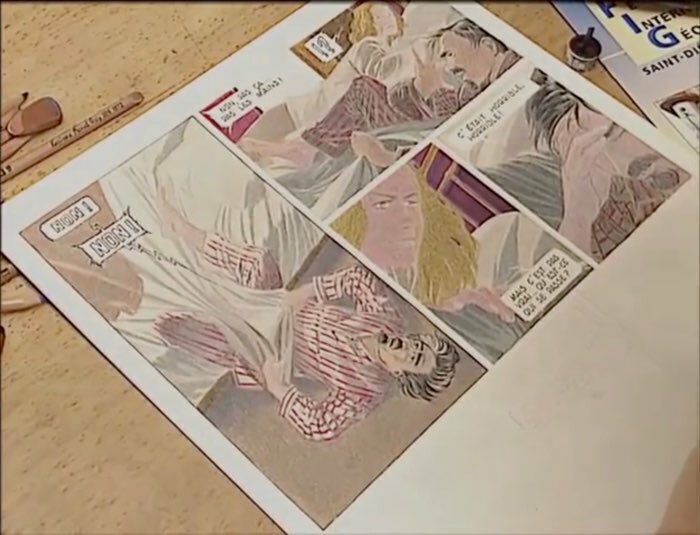 In this video, you see them work through a page, with Schuiten throwing away multiple full-size pages as he works through the layout issues. These “thumbnails” are not thumbnail-sized. 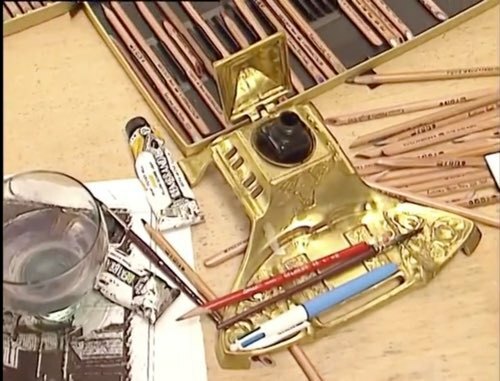 (Lost the time code, sorry) – Schuiten wasn’t using his heavyweight ink bottle holder yet. But he did have this lovely golden thing-a-ma-bobber. Looks like an Egyptian pyramid souvenir. I’m guessing that top would close over the ink jar to keep it from drying up. I also love the blue and white pen with four different inks inside. Those were a big hit at my school in the late 80s or so. 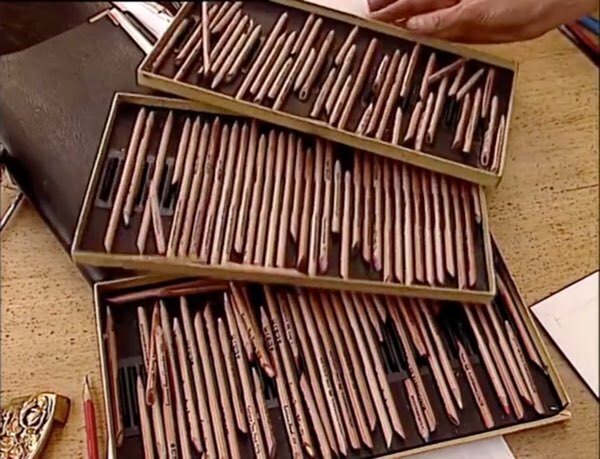 And, yes, that’s a lot of pencils. But not ALL of them. 8:11 – See what I mean? I bet Schuiten never looks around the room for a pencil to draw with. He’s already more efficient than I am. 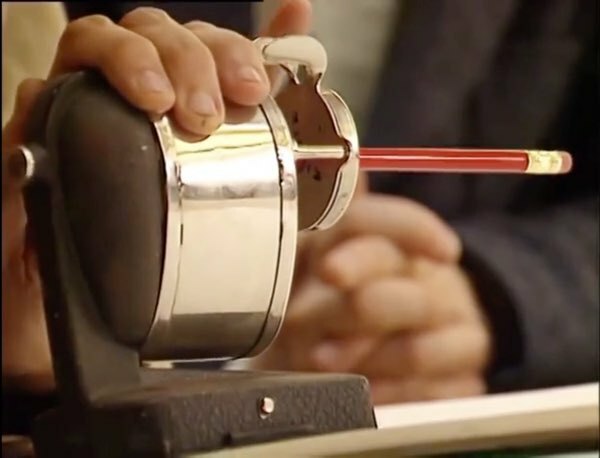 3:56 – He DID use a more traditional pencil sharpener, though! What does he do with all those pencils? 5:40 – He spots his blacks! 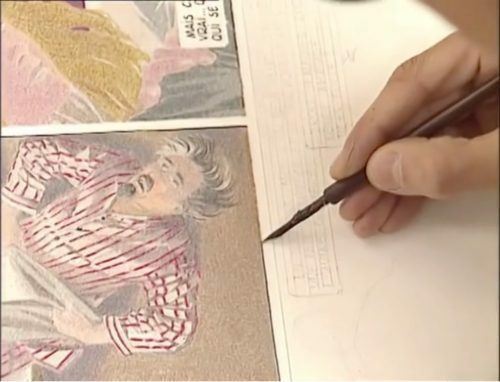 8:27 – He colors the comic in! 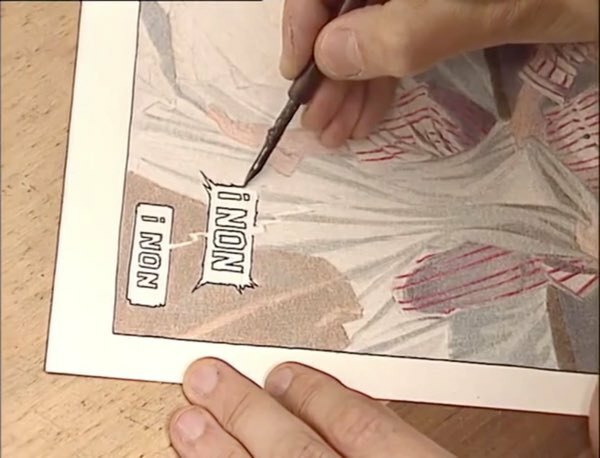 Here’s Schuiten coloring around a word balloon. We’ll get to more of the lettering shortly…. 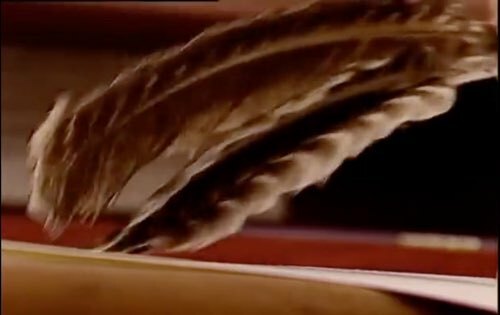 8:49 – He brushes off the pencil/eraser shavings with — feathers. That may be the most gentlemanly thing I’ve seen a cartoonist do since those pictures of comic strip artists in the 60s working in a suit and tie. 7:45 – Schuiten has drawn in the guidelines for his lettering. Sadly, there is no section in the video of him running an Ames Guide across a T-square. 7:24 – Because he’s doing it by eye! It’s possible he’s doing this as a rough, and that the final version will use the exact precision an Ames Guide offers. Or, it’s possible that Francois Schuiten is the Chuck Norris of comics. At this point, it wouldn’t surprise me to find out that this tool isn’t even a T-Square. 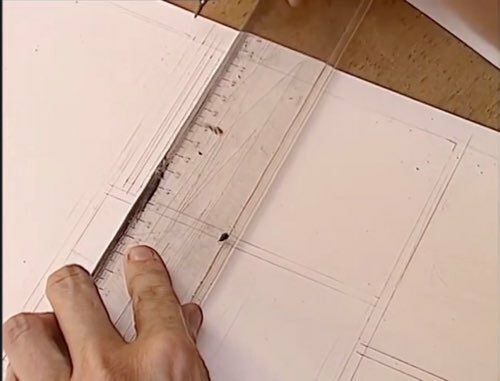 It’s just a ruler and Schuiten’s left hand has a built-in level. Maybe there’s a floating bubble built into his wrist to tell him when his lines are level? 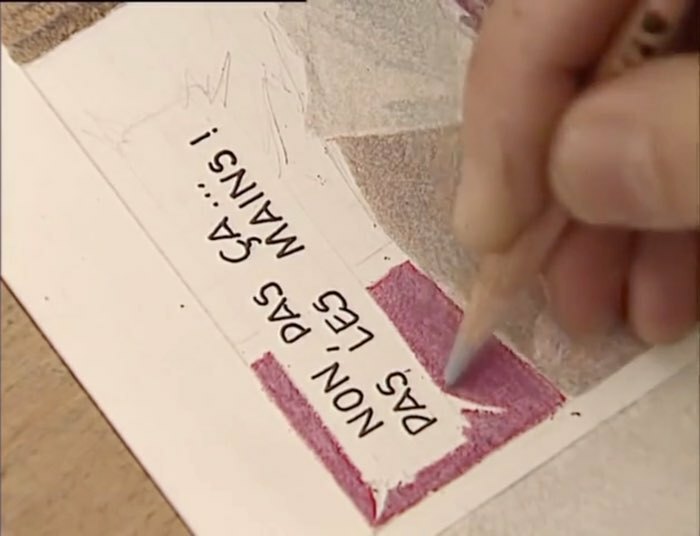 9:42 – Later in the video, as he’s inking borders in, you can see plenty more letters waiting to be inked in below those borders. Looks like he’s working on this page one tier at a time. 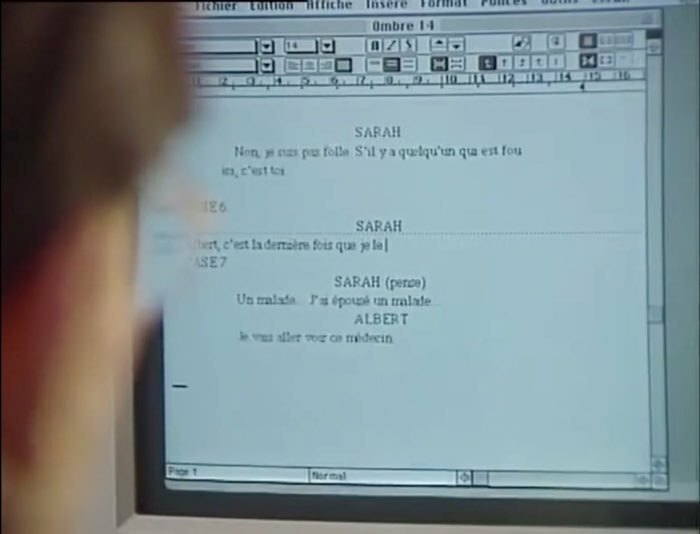 6:53 – The letters come from Benoit Peeters’ script, of course, and here’s a short clip of the writer at work. 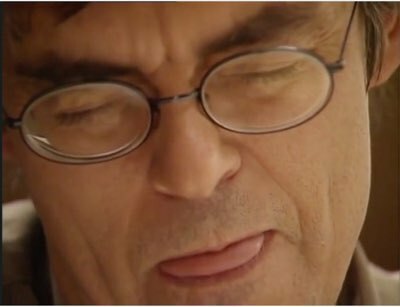 It’s short because watching a writer work is ten times less interesting than an artist. I didn’t convert to a Mac until 2004, so this shot over Peeters’ shoulder is before my time. Which word processing program is he using here? 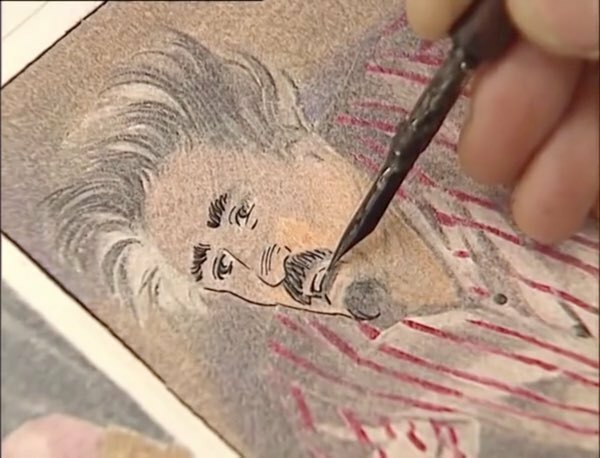 10:29 – Here he is inking over his pencils and his colored pencils and probably some paints of some kind mixed in there, as well. 3:42 – My daughter has a tendency to stick her tongue out when she’s working hard. If she’s trying a new skill in her dance class or trying to dribble the ball down a soccer field, the tongue sticks out. 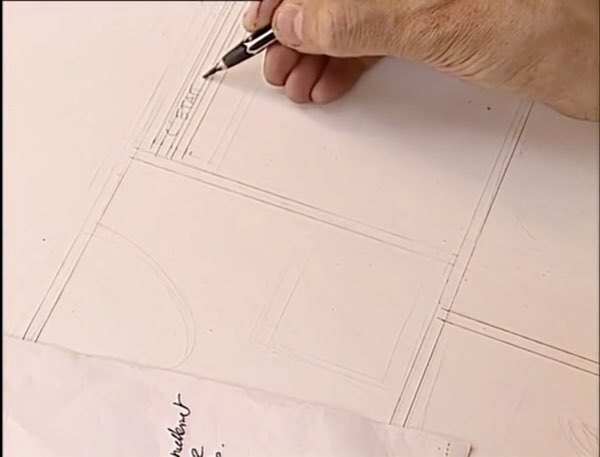 As he’s penciling in some rough panel borders here, Schuiten is thinking so hard that his tongue is coming out, too. Somewhere, there’s a scientific paper that explains this and, in all likelihood, a vaguely Latin-sounding name for the condition. Original article by Augie De Blieck Jr., published at October, 2016. This blog post was created on 2017-04-22 at 13:25 and last modified on 2018-05-06 at 08:40 by Joseph Le Perdriel.